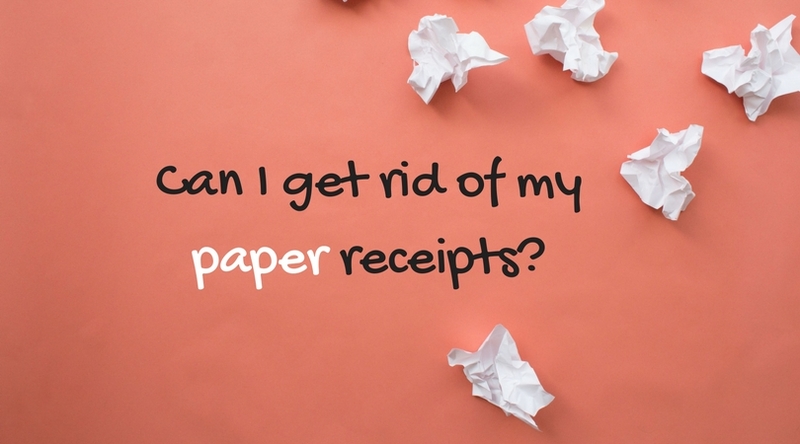 In the modern age with Making Tax Digital looming large on the horizon, is it still necessary to keep paper receipts for all your business documents? Will a scanned copy be enough to satisfy HMRC? Should you keep the paper version as well? The good news is that for most types of sales and expenses, a scanned copy of the invoice or receipt is acceptable. You’re allowed to keep your records on paper, digitally or as part of a software package. The main thing is that records are accurate, complete and readable. What still needs to be kept as a paper copy? For certain documents you do need to hang onto the paper version. This applies to any document that shows a direct tax deduction (other than VAT). It may include your savings interest statement, employment documentation such as P45 or P60, pension documents or share dividend documents. One of my pet hates as an accountant is the dreaded exploding shoe-box; the box crammed so full of receipts that they fly up into the air like confetti as the lid is taken off. Scanned receipts might not have the same confetti issues, but it’s still very possible to be disorganised in the virtual world. Just as physical receipts require filing and organisation, so do their virtual counterparts. You need a system that enables you to find what you need quickly and easily when you’re looking for it. This goes double for company directors who are liable to a fine of up to £3,000 or disqualification as a director for inadequate record-keeping. What digital solutions can I use? It doesn’t have to be bells and whistles, particularly if your business is only small, just something appropriate to your business needs. Here are some suggestions. The simplest option is a scanner to turn your invoices and receipts into pdf files and a system of electronic folders to organise the pdfs. I would recommend a basic folder structure along the following lines. If you find your folders getting more complex, then maybe you need to look for a more robust solution. If you’re using a cloud accounting system, most will allow you to attach scanned receipts to your transaction. This makes it easier for checking as everything is in one place. Many cloud systems have a dedicated email address you can use to forward and upload invoices that you receive via email. Most also have a mobile or tablet app that lets you snap and upload a photo of your receipt; great for recording travel and subsistence expenses on the go. If you generate your sales invoices from your accounting system those records will be there as well. Remember, if you’re using a cloud accounting system and close your business, you may need to continue paying some subscription fees to retain your records for the required period. Going one step further, there are also dedicated receipt processing services which link to the cloud accounting software. Receipts can be sent to the service in a variety of ways including via an app, via email or via an upload to their website. These services do more of the work for you, processing the information from your scanned images so that all you have to do is allocate the expense. Examples include ReceiptBank and AutoEntry. If you are self employed, whatever format you use, you will need to keep your records for 22 months after the end of the tax year e.g. records that fall into 2016-17 need to be kept until January 2019. If you submit your tax return late, it’s 15 months after you sent in the return. A limited company needs to keep records for 6 years from the end of the company financial year that they relate to. Longer if they cover more than one period, relate to an asset with a lifespan longer than 6 years, if you submitted the return late or are having a compliance check on that return. So if you’re short on space, want to save some trees or just hate the clutter that papers records create, fire up that scanner and get going with digital!